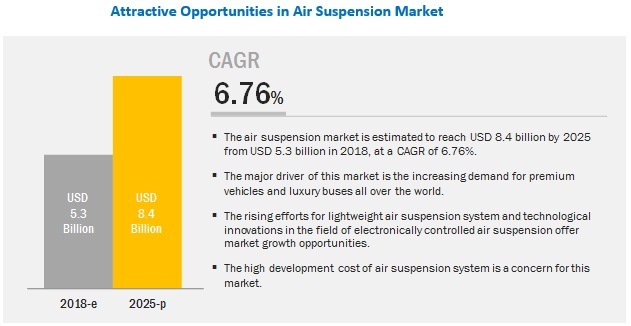 [171 Pages Report] The air suspension market is projected to reach USD 8.4 billion by 2025 from USD 5.3 billion in 2018, at a CAGR of 6.76% during the forecast period. The air suspension market is primarily driven by the increasing demand for luxury buses for long distance traveling and growing significance of comfort and luxury in passenger cars. Non-electronically controlled air suspension systems are expected to dominate the global market from 2018 to 2025. However, electronically controlled air suspension systems segment is the fastest growing market during the forecast period. This is mainly because of its benefits such as higher stability, optimum road grip, heavy load carrying capacity, additional driving comfort, various adjustment options, and enhanced safety level. All these factors would make it a preferred technology in the premium passenger and heavy commercial vehicle segments in the coming years. Air bellow holds the maximum share in the air suspension aftermarket. Europe and North America are the leading markets with a high installation rate of air suspension in the existing heavy vehicles segment. Also, proposed smart city projects, rising infrastructural spending, and expansion of global companies are expected to boost the demand for trucks and buses in the Asia Oceania region. This is expected to boost the air suspension components aftermarket in this region. ECU is anticipated to grow at the highest CAGR during the forecast period for the components segment. The ECU comprises microprocessor, memory, input conditioners, and output drivers. ECU is a key component of an electronically controlled air suspension system that offers better vibration absorption and enhanced performance. Changing preferences towards electronically controlled system would drive the market of ECU in the future. The light-duty vehicle segment is the largest and fastest growing market during the review period. Increasing awareness about the benefits of air suspension and shifting consumer preferences towards comfort and luxury have encouraged premium vehicle manufacturers to deploy advanced suspension technology. Further, improved social status and rising demand for sophisticated features have fueled premium vehicle sales in Asia Oceania. All these factors drive the air suspension market in the light-duty vehicle segment. Europe is projected to lead the air suspension market during the forecast period due to its higher adoption rate of air suspension across all vehicle types compared with other regions such as North America and Asia Oceania. In the light-duty vehicle segment, OEMs such as BMW, Mercedes-Benz, Porsche, Audi, and Land Rover offer ECAS technology in select models to enhance benefits such as height raising and lowering options. In the commercial vehicles segment, air suspension has a higher installation rate in semi-trailers and multi-axle buses. Also, technology-driven suppliers such as Continental, ThyssenKrupp, and SAF-Holland are constantly making efforts to introduce the latest technology in the field of air suspension for light and heavy-duty vehicles. All these factors have resulted in the growth of the air suspension market in the region. Some of the key players in the air suspension market are Continental AG (Germany), ThyssenKrupp AG (Germany), Firestone Industrial Products (US), Hitachi Ltd. (Japan), Wabco Holdings Inc. (Belgium), SAF-Holland (Germany), Hendrickson International Corporation (US), Accuair Suspension (US), and Mando Corporation (South Korea). Continental adopted the strategies of expansion, new product development, collaboration, and mergers & acquisitions to retain its leading position in the air suspension market whereas ThyssenKrupp adopted expansion as a key strategy to sustain its market position. In February 2019, Continental developed a smart air spring system from for enhanced efficiency in the construction and mining sectors. This new air spring system comes with integral sensor technology that provides continuous operational status information in real time. In October 2018, Wabco opened its first Distribution Center in Turkey. Wabco continued its significant investment in the country with a new 2,000 square meter facility in Istanbul. This move enhanced the distribution capabilities for the company’s extensive portfolio of technologies and services to support the needs of local aftermarket customers, original equipment manufacturers, and trailer builders in the country. In March 2017, Hendrickson Truck Commercial Vehicle Systems showcased a new 48,000-pound tandem front air suspension and axle system and a 60,000-pound capacity tandem rear air suspension at ConExpo. This new suspension and axle solution will be offered for the TerexT 110 Truck Crane. The new front suspension and axle system is designed and manufactured to meet the specific needs of the truck crane market. The system includes the STEERTEK NXT fabricated axle, designed to achieve durability, rigid strength, and weight efficiency when compared with traditional axles. Our study suggests that Europe is the largest market for air suspension. What is the market size of the automotive air suspension market in different regions in 2018? What would be the regional growth rate during the next seven years? The study indicates that non-electronically controlled air suspension system dominates the market. However, the demand for an electronically controlled air suspension system is anticipated to be significant in the next few years. The study indicates that semi-trailer holds the maximum share of cabin air suspension. How would the upcoming regulatory changes and market trends impact the cabin air suspension market? What would be the regional growth rate for the next seven years? What is the average replacement life of air bellows and shock absorber bushes? What would be the growth rate for the next seven years? What is the average selling price of air suspension system for a light-duty vehicle, heavy truck, and buses? What is the average cost of different air suspension components, and what are the pricing trends of this equipment? Figure 25 Bottom-Up Approach has Been Used to Estimate and Validate the Size of the Air Suspension Market, By Components. Figure 27 Bottom-Up Approach has Been Used to Estimate and Validate the Size of the Cabin Air Suspension Market, By Vehicle Type. Figure 29 The Bottom-Up Approach has Been Used to Estimate and Validate the Size of the Air Suspension Market, By Vehicle Type. Figure 31 A Bottom-Up Approach has Been Used to Estimate and Validate the Size of the Air Suspension Aftermarket, By Component. Figure 33 Bottom-Up Approach has Been Used to Estimate and Validate the Size of the Air Suspension Market, By Region. The study involved four main activities to estimate the current size of the air suspension market. Exhaustive secondary research was done to collect information about the air suspension market, by component, technology, vehicle type, and components aftermarket. The next step was to validate these findings, assumptions, and market analysis with industry experts across value chains through primary research. The bottom-up approach was employed to estimate the overall market size for different segments considered under this study. The secondary sources referred for this research study include automotive industry organizations such as European Association of Automotive Suppliers (CLEPA), Automotive Parts Manufacturers' Association (APMA), Organisation Internationale des Constructeurs d'Automobiles (OICA), European Automobile Manufacturers Association (ACEA); corporate filings (such as annual reports, investor presentations, and financial statements); and trade, business, and regional component related associations. Secondary data has been collected and analyzed to arrive at the overall market size, which is further validated by multiple industry experts. Extensive primary research has been conducted after acquiring an understanding of the air suspension market scenario through secondary research. 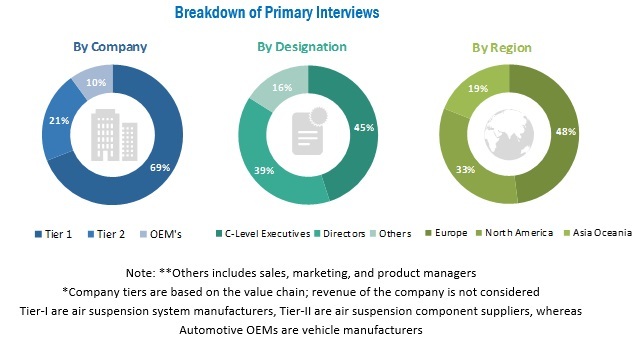 Several primary interviews have been conducted with market experts from both the demand- (OEMs) and supply-side (air suspension system and component manufacturers) across four major regions, namely, Asia Oceania, Europe, North America, and the Rest of the World (RoW). Primary data has been collected through questionnaires, emails, and telephonic interviews. In the canvassing of primaries, we have strived to cover various departments within organizations, such as sales, operations, and administration, to provide a holistic viewpoint in our report. The bottom-up approach has been used to estimate and validate the size of the air suspension market, by vehicle type. Country-level model mapping was done to determine the vehicle type-wise air suspension market size, in terms of volume. The vehicle production number has been multiplied with country-level penetration of air suspension system for each vehicle type (which was derived through extensive model mapping, secondary sources, and validated from multiple primary interviews). The country-level air suspension market size, in terms of volume, of each vehicle type was added to derive the regional-level market size and further to get the global air suspension market, by vehicle type. To arrive at the market size, in terms of value, the country-level market was multiplied by the average selling price of air suspension unit for each vehicle type. Summation of country-level market sizes gave the regional-level market, and the summation of regional-level markets gave the global air suspension market, by vehicle type, in terms of value. A similar approach was followed to derive the air suspension market by component (air springs, shock absorber, compressor, electronic control module, air reservoir, height sensors, solenoid valves, and pressure sensors), technology (electronically controlled and non-electronically controlled), cabin air suspension by vehicle type (rigid trucks and semi-trailers), and aftermarket by components (air bellows and shock absorber bushes). All percentage shares, splits, and breakdowns have been determined using secondary sources and verified by primary sources. All parameters that are said to affect the markets covered in this research study have been accounted for, viewed in extensive detail, and analyzed to obtain the final quantitative and qualitative data. This data has been consolidated, enhanced with detailed inputs and analysis from MarketsandMarkets, and presented in the report. The data was triangulated by studying various factors and trends in the demand and supply sides in air suspension market. This research report categorizes the air suspension market based on component, technology, vehicle type; cabin air suspension, by vehicle type; and aftermarket, by component and region.